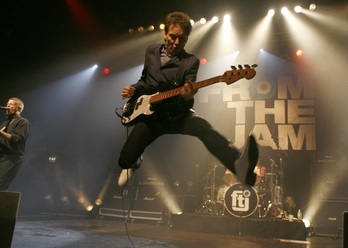 Early in 2013 'From The Jam' performed several acoustic shows to amazing reactions. On the strength of this, Bruce and the chaps have decided to go out on the road in March 2014 and perform all the classic hits with an acoustic feel. 'The Jam' had amazing chart success with eighteen singles and seven albums to make the top 40 in the United Kingdom; from their debut in 1977 to their break up in 1982. Their last five albums were all top ten hits and their last eight singles made it into the top ten. 'Just who is the 5 o'clock hero?' made the charts at number 8, as an import and remains the best-selling import single of all time in the UK. 'The Jam' are one of the biggest selling bands in British music history. Absolute beginners ~ Town called Malice ~ Precious ~ 'Just who is the 5 o'clock hero? Book Early to save disappointment!